Cybermen were originally a wholly organic species of humanoids that began to implant more and more cybernetic parts into their bodies. This led to the race becoming coldly logical and calculating, with emotions usually only shown when naked aggression was called for. Although the Cybermen often claim that they have done away with human emotion, they have exhibited emotions ranging from anger to smug satisfaction in their confrontations with the Doctor. The race originated on the planet Mondas, Earth's twin planet in prehistoric times, which was knocked out of solar orbit and drifted into deep space. The Mondasians, fearful for their race's survival, sent out spacecraft to colonize other worlds, including Telos, where they pushed the native Cryons aside and used the planet to house vast tombs where they could take refuge in suspended animation when necessary. On Mondas, the native inhabitants installed a drive propulsion system in place of the planet's core. 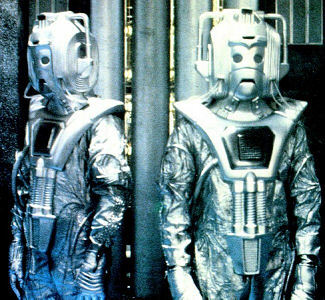 As the original race was limited in numbers and were continually being depleted, the Cybermen became a race of conquerors who reproduced by taking other organic beings and forcibly changing them into Cybermen. The one and only encounter that the Mutt Squad ever had with the Cybermen came as a result of the Empire's invasion of Earth. The Empire had aligned itself with the Cybermen and was using them as shock troops in key locations and the Mutt Squad faced off against them when they attempted to liberate the Vatican. The fight was a long bloody one with the Mutt Squad finally coming out on top. Since then there have been rumors that the Telosian Cybermen have been seen on the outer most fringes of the known universe looking for something.